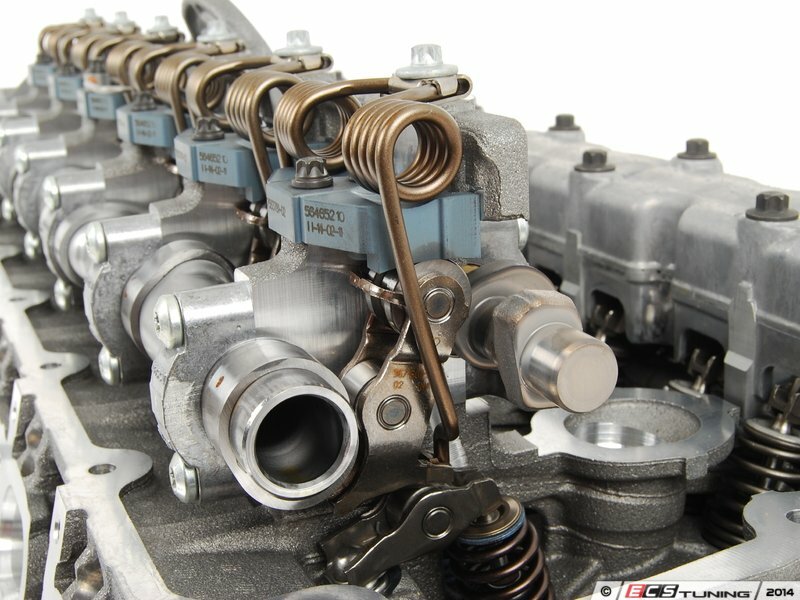 the N55 uses all the same valvetrain parts as the N52 (the eccentric shaft is a little different, but this is mostly due to the smaller/faster valvetronic motor). Consequently, the maximum lift is the same (~9.9mm). I would just set it to 10mm. It's not going to "break" anything. It appears that what happens is the DME will try to adapt closer to the 10mm target as it can get, where if you leave it at the stock setting it will be closer to 9.5-9.6mm in reality. It also means that any valve lift mods that work on the N52 should also work on the N55. I agree any mod for the N52 will work for the N55, but I am not following your logic on the only 9.5-9.6mm stock lift. The stock table lists 9.8mm at 100% throttle, why would you think it is only reaching 9.5-9.6mm? Throttle is at 100% in logs, so it's not trying to limit boost or close the valves. I just want to compare what the stock N52 table lists vs what the literature has as max lift. 9.8 is the base factor. A whole host of other factors are included in the actual lift value - adaptations, torque adjustments, etc . so just because the WOT map says 9.8mm, doesn't mean its opening the valves exactly 9.8mm. Throttle opening has nothing to do with it. On the N52, the throttle plate is open 100% at 60% pedal value - the N55 will be similar. Stock 330i tune maxes out at 9.7mm. 325i and 328i have less but they are detuned. 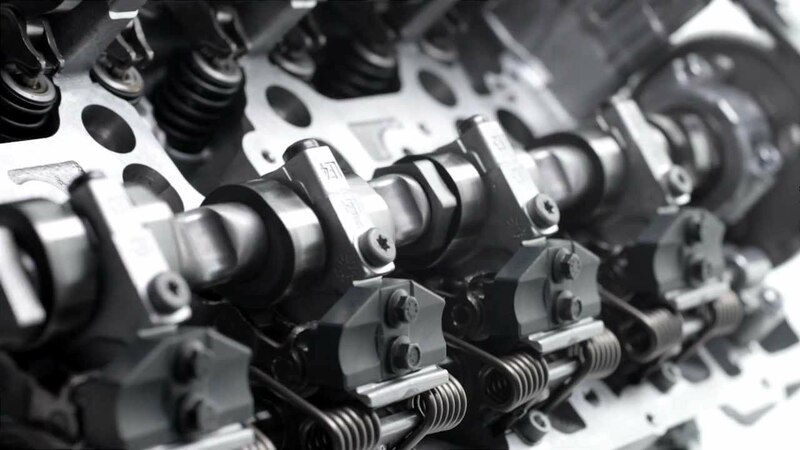 There is a hard stop on the Eccentric cam, so at mac Ecc Cam- max valve life will be 9.7-9.8, N55 maybe 9.9mm. There is no getting more that the hard stop. If you program in 12mm, it will still only go to the max at the hard stop. And it might not even go all the way to the hard stop. I think that the min and max hard stops are for the ECU to calibrate and check the range of the ECC Cam sensor. Something like- Take a reading at close, zap the ECC Cam motor till it hits the max hard stop, take a reading and then back to the min hard start and then the engine starts. Now the ECU knows where the max hard stop is at. the values in the valve lift maps are commanded targets - they are not used to learn the valvetronic stops. the "learn stops" algorithm is separate entirely, and it is generally only run once (if there's a change or adaptations are cleared). per BMW, the maximum lift is 9.9mm which I take to mean at the mechanical limits of the eccentric shaft. In practice (due to adaptations and other factors I mentioned), if you command 9.7mm you will get about 9.5mm, consequentially, if you command 10mm you might get closer to the 9.9mm maximum although obviously 10mm is not possible. I now have a full disassembly of MSV70 with all memory values named and mapped, so I can study this a bit further, although sometimes the math can be difficult to follow.. The head and valves on the car are BEAST, but the cams and vanos hold the engine back from making more. Good street numbers with our tune, AA headers, 3 stage or n54 intake manifold, no maf & full exhaust will make around 245 - 255rwhp. This is good to know that the cams are holding back power. Hopefully another 0.5mm of lift will help that out. Picked up parts from the machinist last week after working nights. Now out of town working for a living. Will be home late tomorrow night. Should be able to test the last #3 version and then decide which version to use. Then drop off some more to get machined. And then the holidays get in the way. Might be able to send one to HassMachine to test fit and measure on his engine. That would be awesome! I'm going to start disassembling my head soon. How about now? Or yesterday! Yesterday I got off a cruise ship from Mexico. Today, I feel like the ground is still moving.. I hope you didn't drink the water. So, there is always tomorrow. I'm just being a post holiday new year lazy bum with busy regular work gig thrown in and 20* weather. I did get 2 more sets of parts to get machined. Now have 7 sets for the machinist. 3 new and 4 used. The used pieces have no measurable wear. They are probably better as they have been heat cycled and hardened. I still have to install version 3 mod and measure it out but I think that it will be version 2 that will get the nod, it has half the machining steps as version 3 and version 3 might add too much lift than I feel comfortable with. To install this mod, the valve cover has to come off and I would reckon that a new valve cover gasket kit would be needed also. It also needs a 1/4" drive external torx socket E8 and short extension, 22mm socket to turn the crank, and a 1/4" torque wrench. On the N55 turbo to N52 head front, none of the manifold mounting bolt holes line up. The port spacing does line up and when the ports are lined up, all the bolt holes don't line up. So new plan is to make a 3/4" adapter plate that will bolt to the N52 head with counter sunk socket head bolts and the stock N52 studs will then be screwed into the adapter plate at the N55 bolt locations and then the N55 turbo will bolt on. Actually the 3/4" plate will add needed clearance for one webbing rib on the block and the block water fitting. N55 Turbo--->N52 exhaust studs--Adapter Plate--counter sunk socket bolts<---N52 head. Adapter plate also needs to adapt the different size of the exhaust ports. It worked out perfect using a piece of 1.625" 0.063" wall tubing as the OD is the same as the N52 and the ID is the same as the N55. The first plate will be made in HDPE with alumn tubes because it is the easiest to work with for the mocking up. Remind us again, what's v1 v2 and v3? Last edited by CobraMarty; 01-09-2017 at 10:22 PM. Plan on hitting the dyno? Not my pictures but I will use them to illustrate install. Last edited by CobraMarty; 01-11-2017 at 07:01 PM. 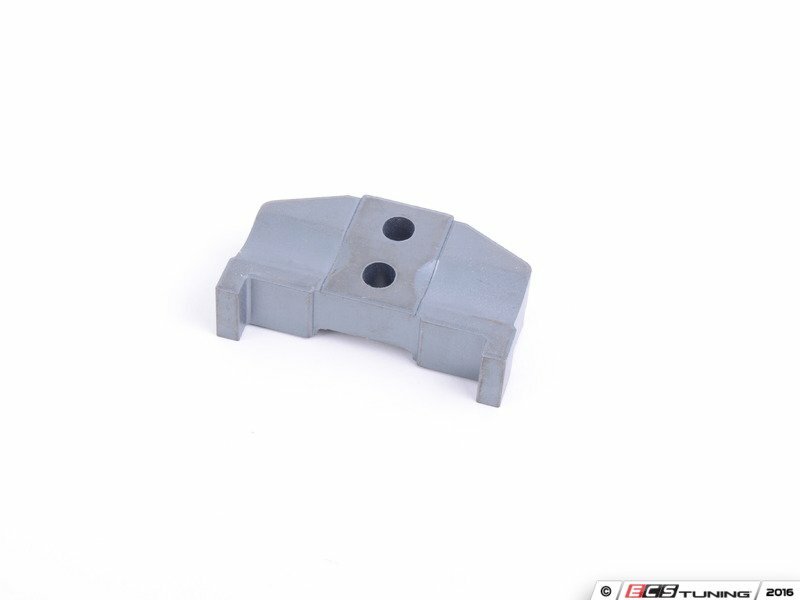 The rectangular 'support' in the 3rd picture (that is what BMW calls it) is the piece that gets modified, machined and needs to get changed out. Unfortunately it is not a simple unbolt and replace. It just doesn't slip out when unbolted. N52 + N55 – Twin cam, 4 valves per cylinder, valvetronic engines produced from mid 2000s to current (US), Cylinder numbering is from front to rear; 1 at the front and 6 at the rear. Ignition firing order is 1-5-3-6-2-4. 4- insert spacer under spring and tighten. COUNT how many turns to tighten. This will raise the spring 'coils' up enough to allow for the 'support' to be removed. 9- repeat for other 'supports' Use sequence cylinder 1-5-3-6-2-4. MOST Important is to turn over the engine CW to get the intake cam lobe into the proper position and ONLY loosen the spring bolt a MAXIMUM of 5 turns. Last edited by CobraMarty; 08-22-2017 at 08:44 AM. 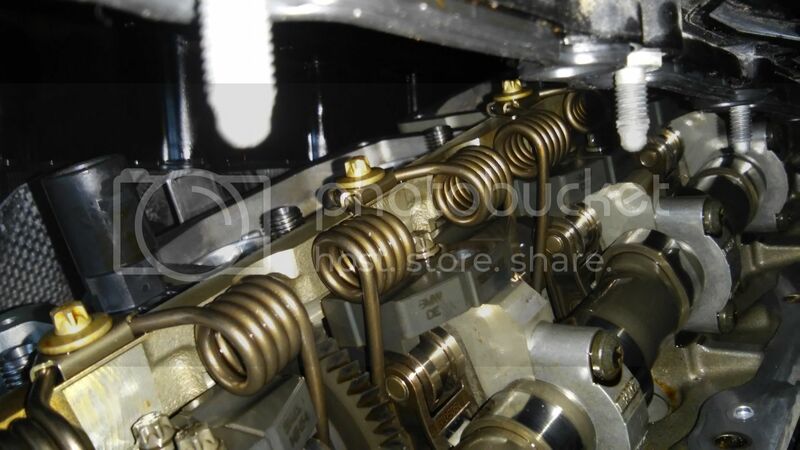 8- remove spacer under spring and tighten spring bolt to spec. When are we going to do some live testing? Even the newer engines with the 'springs' and 'Eccentric cam motor' down low, they use the same part and would be a much easier install. Last edited by CobraMarty; 01-13-2017 at 09:31 AM. The part is die cast, super precise and accurate out of the mold. No additional machining required or done by BMW. They are steel and are not hardened. Very expensive to manufacture unless you are making a few million of them, like BMW. Last edited by CobraMarty; 01-13-2017 at 09:18 AM.